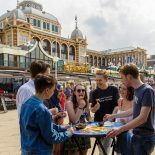 Living in Leiden may not have the appeal of larger cities like Amsterdam, with its shopping, eating and partying possibilities, but what it lacks in terms of vibrant nightlife it makes up for in cultural events. Almost every weekend there is something on offer, although finding out about these activities often proves a bit of a chore. A while ago I spied a leaflet for a Buddhism weekend in the Volkenkunde museum on February 2nd and 3rd. It was lucky that I picked it up from among a few other fliers, because otherwise I almost certainly would not have known about it and I would have missed out on what turned out to be a super fun, enjoyable and educational weekend. I spent Saturday and Sunday trotting around the museum, going to some of the many workshops and demonstrations on offer. 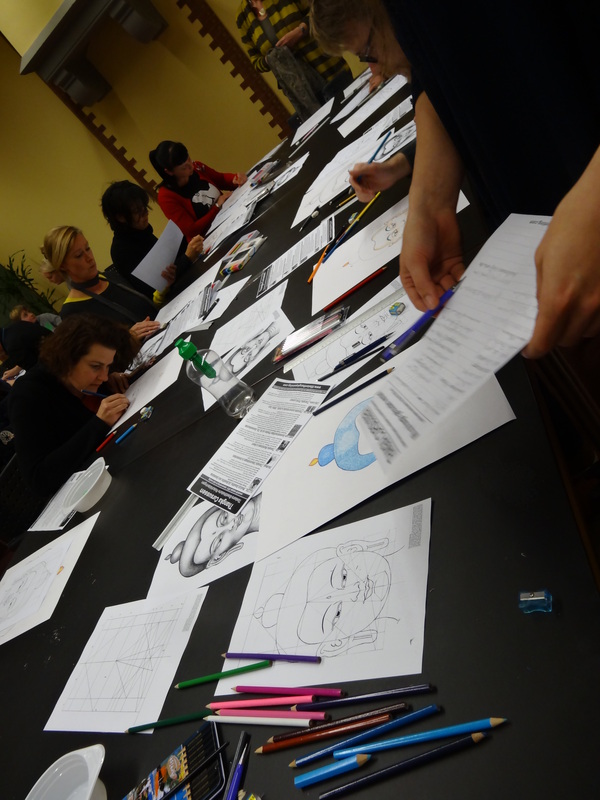 There was mandala drawing, shakuhachi concerts, tours around the Buddhist artifacts in the museum, but two workshops in particular really made my weekend. I’ve never been to a martial arts class before, so I wasn’t sure what to expect. What unfolded was 45 minutes of movement, breathing, laughter and…hugging. In one exercise we had to catapult ourselves towards our partner to hug them, while they took up position to hold us off. It wasn’t about being physically strong (lucky for me! ), but about standing in such a way that your whole body works to hold off the hugger, even without bulging biceps. Very cool. And for those of you who’re interested, there will be weekly lessons at the Volkenkunde every Wednesday at 4pm, starting this week. Check out the details (in Dutch) here. And the best part? As students at Leiden we get in free! I missed the first one, but I want to go along in a couple of weeks (no lesson on 13th Feb) to check it out, and maybe I’ll see some Leidener readers there too. 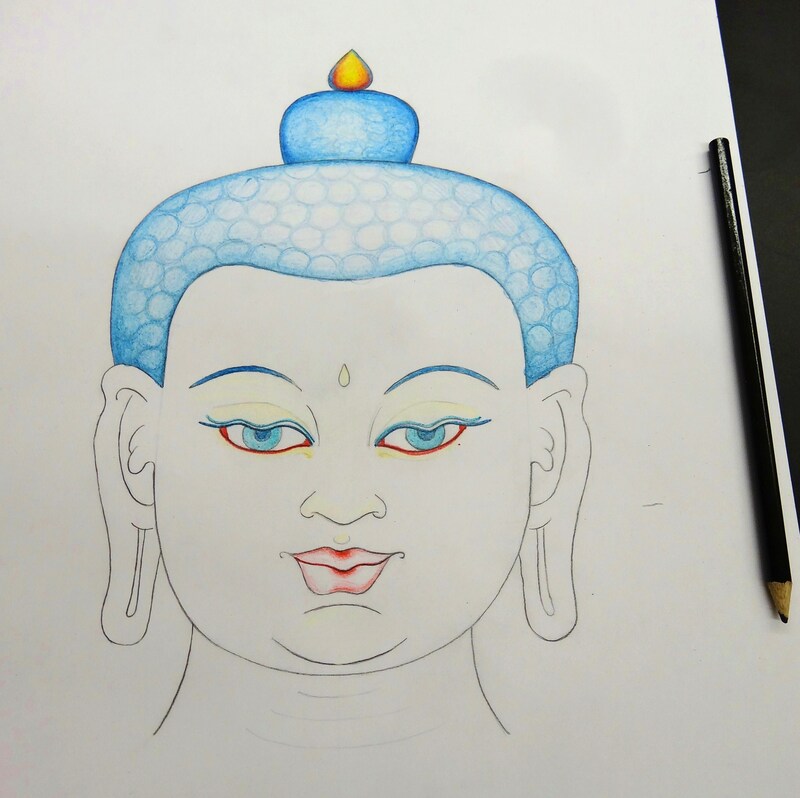 Sunday afternoon was spent learning how to draw the face of the Buddha according to Tibetan Thangka tradition. Our teacher was Carmen Mensink, whose website is well worth checking out for courses and inspiration. 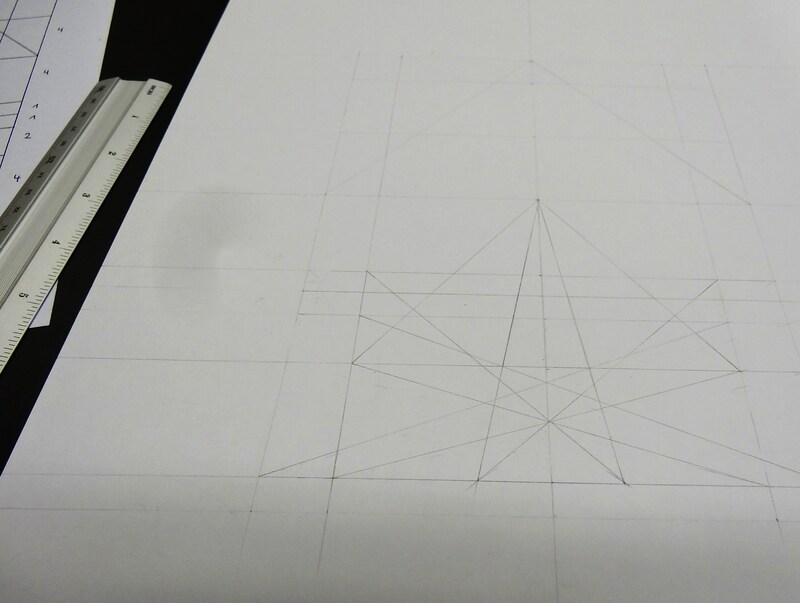 The first thing we had to do was replicate a grid on which to draw the face. This in itself was a little tricky, and I have to admit to several false starts before I had completed mine. 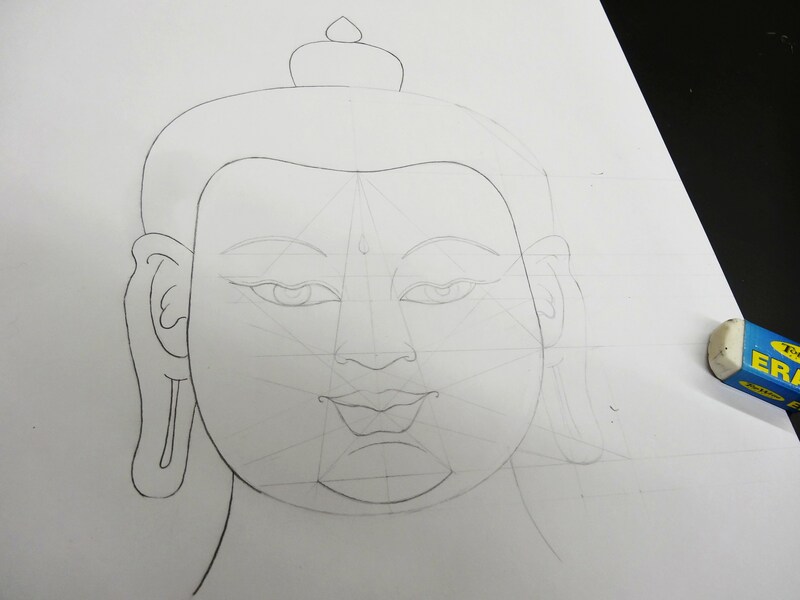 Next we started to draw the Buddha’s face, copying from an example. 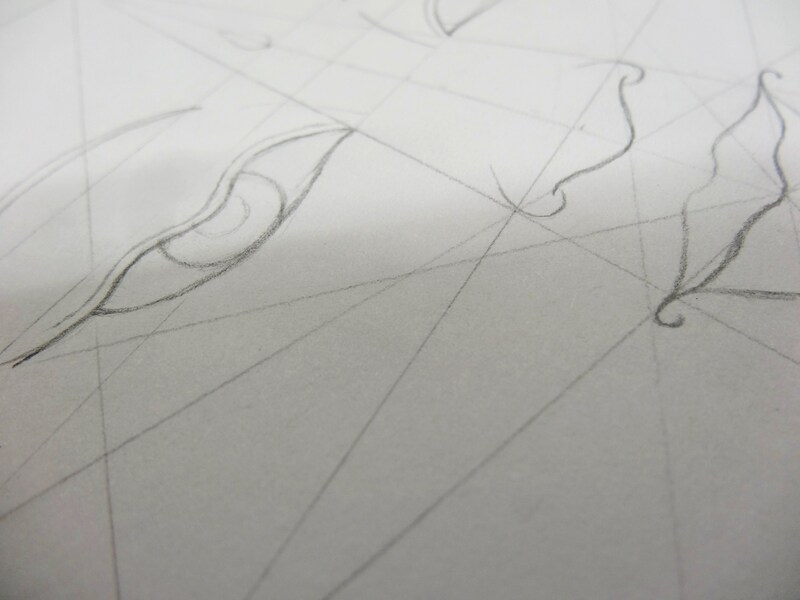 This took a long time, and was really meditative, as we focused on drawing lines and keeping the face symmetrical. Even when I thought mine was finished, Carmen held it upside down to show me that actually, my Buddha’s chin was not symmetrical. Back to work. 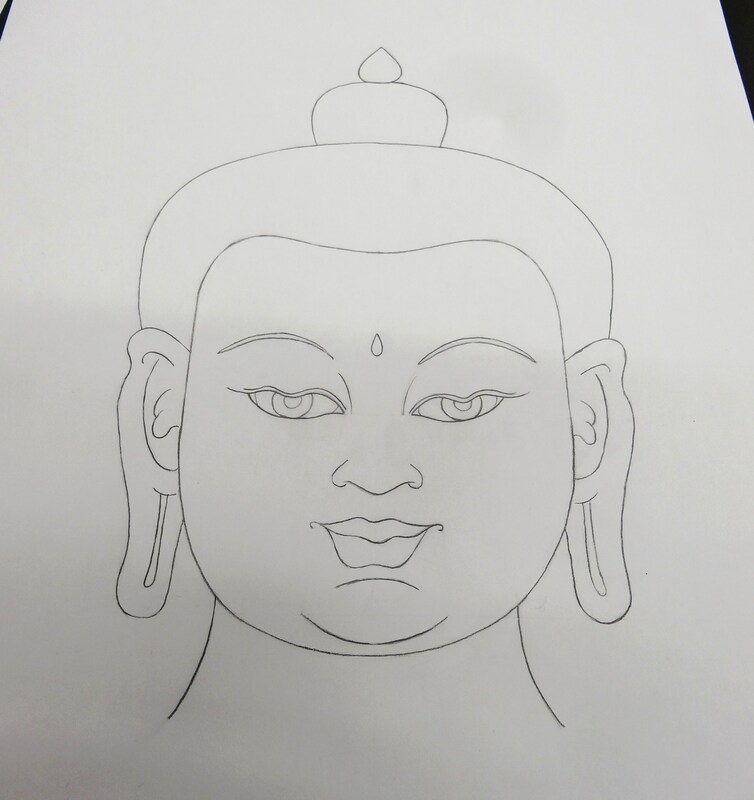 Finally our outlines looked good enough, for thangka novices, and we moved on to colour! In Tibetan thangkas, the Buddha’s face is often gold and his hair is a very deep blue. Working with colour pencils though, we couldn’t quite get the right shades, but again, working with the pencils to create a good colour was a very thoughtful experience. And there you have it, my (almost) finished Buddha! Carmen said that new thangka artists can spend months doing nothing but drawing the Buddha’s face over and over again, and I can see how such a simple-looking action is deceptively tricky. We walked around looking at each other’s drawings, and everyone’s Buddha face was different. I think mine is a very girly face, while my male friend’s was definitely masculine. There were a couple of children in the class, and their very accomplished images actually looked like depictions of children. So, it really is worthwhile keeping your eye out for random posters and fliers in Leiden. That also means looking out for Dutch information too. For example, this Buddhism weekend seems to have only been advertised on the Dutch version of the Volkenkunde website. But I encourage you to persevere, and make an effort to try out anything you hear about in Leiden. This entry was posted on February 8, 2013 by admin@theleidener in Culture, Emily, Leisure and tagged buddhism, chi kung, international student, thangka, volkenkunde.